Message boards : Number crunching : Server can't open database? 13/09/2009 11:01:19	Milkyway@home	Sending scheduler request: Requested by user. Message 30651 - Posted: 13 Sep 2009, 10:07:45 UTC - in response to Message 30649. Why is the server not able to open the database? server seems fine but someone is not looking at whats going on. I see this has been happening for over 9 years. Can't anyone figure out and fix the root cause? Message 68079 - Posted: 30 Jan 2019, 16:24:16 UTC - in response to Message 68076. I see it, too. Idk what's wrong, it seems to always fix itself. I would just ensure you have enough work to get through it, and it shouldn't be an issue. Message 68080 - Posted: 31 Jan 2019, 0:14:30 UTC - in response to Message 68076. I always assumed it was some process running, like a backup, cleanup, whatever that needed to close the database. But you are right every morning about the same time it goes off line. Message 68091 - Posted: 1 Feb 2019, 21:39:00 UTC - in response to Message 68080. But three hours a day...every day! It's long overdue for some explanation if not a resolution. Message 68126 - Posted: 9 Feb 2019, 16:08:51 UTC - in response to Message 68091. I also think an explanation is in order. But I am now putting my RX 570 on Folding. They are willing to give you work, and it is useful science. These DB outages are bad enough on the Milkyway project but they also impact other projects I run on my machines. 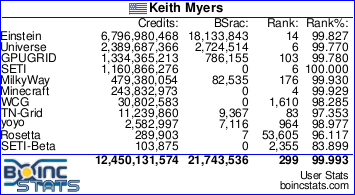 When BOINC Manager issues an update request for Milkyway@Home, either to report completed work or because I asked for an update against the project, BOINC puts that request on a sequential stack. If other running projects cause an update of their status while the Milkyway request is being processed and Milkyway's DB is down then due to the extraordinarily long time it seems to take just to say "it's broken" those other project requests can't be serviced until Milkyway issues a reply. So can Milkyway project admins please stop ignoring this problem and put some technical effort into operational efficiency improvements at the brief expense of the cascade of application development? I'm sure it will be worth the effort. You can change the connection timeout to something shorter than stock in cc_config.xml so that it gives up faster on MW and can then service your other projects. But as you state, it would be best if the project fixed its server database unavailability problem as soon as possible. Message 68146 - Posted: 12 Feb 2019, 9:00:05 UTC - in response to Message 68139. I get what you're suggesting but it would bother me that cc_config.xml is a global configuration item for cpu-bound projects; nvc-config.xml would have to be set to cover gpu-bound apps, too. Would tell the client to abort the file transfer if the effective connection speed was less than 9600 bits per second for 90 seconds. Sorry! but I'm disappointed with the project admins ignoring this issue so I'll run down the last few work units I've got left and will leave MW for now. I tried to reply 5 hours earlier but the website went down while composing. As far as I can tell the transfer timeout is watching the handshake between the client and the scheduler. If the client doesn't get an acknowledgment from the scheduler in the allotted time, then abort the connection attempt. It doesn't put a clock on any actual transfer of tasks. This is what I observe. Set http_debug in your Event Log options so see all the handshake communications on a scheduler connection. Message 68156 - Posted: 13 Feb 2019, 8:04:14 UTC - in response to Message 68152. Message 68198 - Posted: 4 Mar 2019, 17:12:40 UTC - in response to Message 68150. With collatz excluded since February that leaves only amicable numbers as the remaining ATI GPU capable project that still pay rewards. Message 68200 - Posted: 4 Mar 2019, 22:05:52 UTC - in response to Message 68198. Those are just occasional glitches. Milkyway and SETI are back already. Collatz will be back soon too, I guess. Message 68213 - Posted: 6 Mar 2019, 21:16:51 UTC - in response to Message 68152. Doing what you suggested doesn't actually fix the problem. It is clearly a problem on the server side, not ours. No matter what I set the timeout to, the problem still happens.